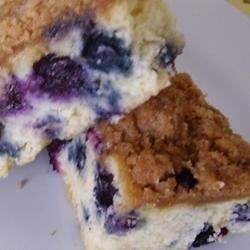 "A fabulous blueberry coffee cake with a crumb topping. This recipe is one from a local B&B that I replaced all the sugar with substitutes because I have diabetes. I have received all praise and 'I can't believe it is sugar free.' The sugar can be put back in if you want. Either way it is wonderful." Preheat the oven to 350 degrees F (175 degrees C). Grease and flour a 9x13 inch baking pan. Bake for 35 to 40 minutes in the preheated oven, until a toothpick inserted into the center of the cake comes out clean. This cake is best served warm. This was not very good at all. It could have been my error, but the taste and the texture were off. I'm always looking for sugar-free recipes because my mom is diabetic. I'll keep searching. my mother is diabetic and i am always lokking for recipes like this.... i made it this morning she loved it and my father who isnt diabetic loved it as well. I made this with regular sugars and it was moist and delicious. I suggest baking it 5-10 min. longer than recipe calls for. This one's a winner!